has started working as a tattooer when he was 23 years old. He mainly focuses on the large piece of works, especially on landscape of working and also his uniqueness. Furthermore, he started to join the competition in Thailand in 2009 and 2010. Also, in 2010, he won the awards over 35 times in Australia. On the other hand, from his perspective, his greatest awards ever is absolutely from smiles and sastification from his customers. has started working since 2009. His style of working is very unique especially sharp of texture and beautiful clear of color and also his expertise is on cover and fix the errors. Smile Tattoo is a group of people who truly love and adore body arts. Each tattooist has graduated from a famous well-known art University. Through our journey we have the knowledge & experience to design various styles of quality tattoo’s which are unique, suitable and special for each client. We specialize in Oriental, Black & Grey, Japanese, color & tribal tattoos but our professional artists can cater for any style you desire. We always pay high attention to every piece of artwork as we work on quality rather than quantity. At Smile Tattoo we only use professional equipment and have all the required cleanliness certificates. We are a great award winning tattoo shop guaranteed and we have received over 35 prizes from competition’s worldwide. This is why Smile Tattoo is the great choice for tattoo lovers. 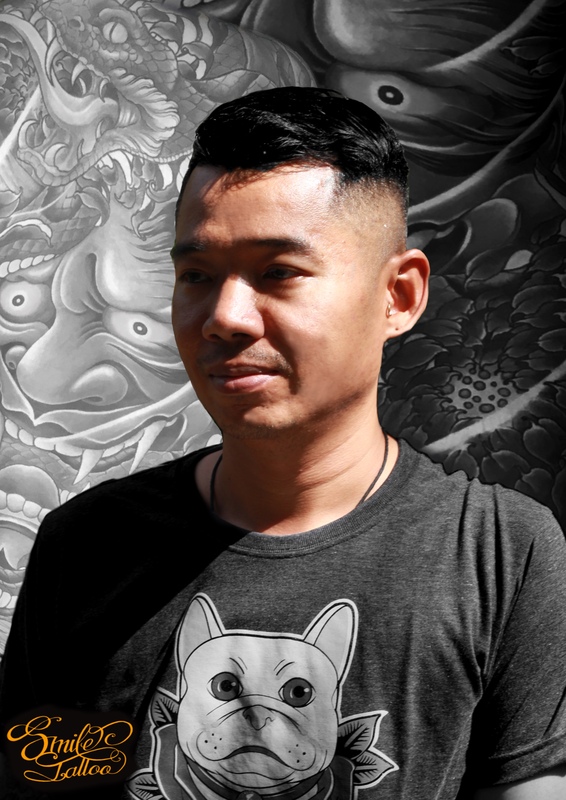 Copyright © 2019 Smile Tattoo Phuket.